John Kalliel is glad he took his bunny, Bugs, to be checked out right away when his pet stopped putting weight on his right front paw. 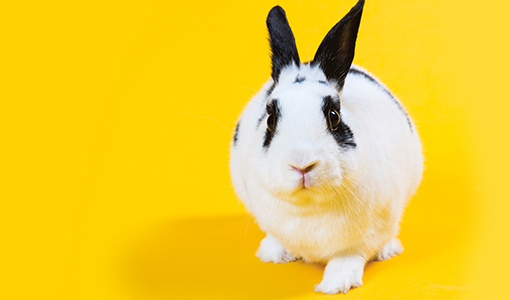 When a veterinarian in Maryland took a look at the radiograph, she discovered a serious infection in the rabbit’s second toe. “The bone was getting eaten away by something,” Kalliel said. The vet amputated the toe to prevent the infection from spreading and sent a tissue sample out to be cultured. Shortly after Kalliel moved to New Hampshire, he learned that Bugs’ infection had been caused by the pathogen Mycobacterium. This family of bacteria includes the bug that causes tuberculosis, the highly contagious disease that can be transmitted between animals and people. Several weeks later, Bugs stopped using his right foot again, so Kalliel brought him to Cummings Veterinary Medical Center, where Emi Knafo, V08, an expert in caring for exotic pets, took on the case. Because Mycobacterium infections can be aggressive, Knafo performed a CT scan to assess the extent of it. She and veterinary surgeon Rob McCarthy, V83, removed Bugs’ right leg up to the shoulder along with an enlarged lymph node in his armpit to prevent the bacterium from spreading to his vital organs. Knafo sent tissue samples out for additional testing to determine which type of Mycobacterium was the culprit. Because of the risk that Bugs’ infection could spread to people and livestock, she communicated frequently with state veterinarians in Massachusetts and New Hampshire and with officials at the U.S. Department of Agriculture.